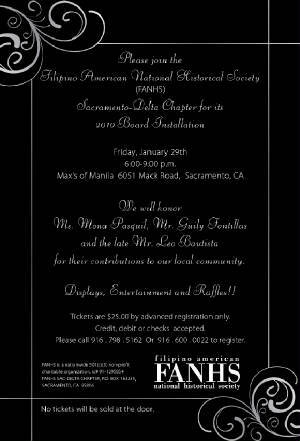 The chapter Installation Dinner is on January 29, 2010 from 6-9PM, Max's of Manila in the Seafood City complex on Mack Road, Sacramento. For tickets please email fanhsac@lycos.com or call 916-600-0022. Please stay posted for additional updates and details. For more information please email fanhsac@lycos.com or call 916-600-0022. ~ FANHS Sacramento-Delta Chapter Executive Board. Please note that the editors make every effort to provide timely and accurate information when and wherever possible. If you believe there is an error in any information provided and listed in these web pages, please e-mail us directly at: fanhsac.tripod.com and note in the SUBJECT line: Website. We will research the information provided and determine appropriate action. We appreciate and value your input.